We recommend this service for small to medium sized commercial premises. Brown Rat; Black Rat; House Mouse; Oriental Cockroach; German Cockroach; American Cockroach; Crickets; Larder Beetle; Silver Fish and Firebrats. Additional pests may be included by agreement between the client and Rokill Limited. Normally 8 detailed inspections (this can be increased to 12, 26 or a bespoke number specific to the needs of the site) and any treatments required from one of our qualified technicians per annum at regular intervals for the premises covered by the Service Schedule. Precautionary baits will be maintained and changed regularly in areas of high risk. Infestation by the scheduled pests will be treated as necessary. A follow up service will be carried out to ensure the successful eradication of a rodent or specified insect infestation, normally within 14 days. Any follow up treatments for the specified pests are free of charge. Infestation by pests other than those listed above will be reported to the client together with recommendations for eradication. Report to the nominated pest control representative on arrival to discuss any reports of infestation. Report detailing any infestation found and any conditions which could adversely affect the control of pests on the premises at the end of each treatment. This is now required under current legislation. 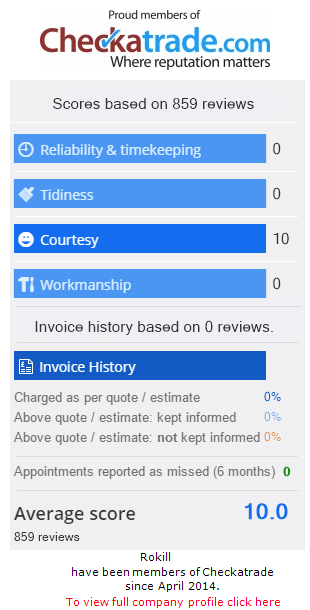 All contracts are individually priced and are dependent on the premises – to arrange your free no obligation survey; please contact our experienced Service Control Team by calling us on 0800 7830011. We recommend this service for medium to large sized food manufacturing companies and their supply chain. It complies with the requirements and codes of practice of the BRC and major supermarkets, and can be amended to comply with M&S code of practice. Brown Rat; Black Rat; House Mouse; Oriental Cockroach; German Cockroach; American Cockroach; Crickets; Silver Fish; and Firebrats; Ants; Additional pests may be included by agreement between the client and Rokill Limited. A bespoke service determined through analysis of risk to your product, as stipulated by BRC Food Manufacturing Standard. 8 detailed inspections and any treatments required from one of our qualified technicians per annum at regular intervals for the premises covered by the Service Schedule. Infestation by the scheduled pests will be treated as necessary. The follow up regime (as agreed previously) will be carried out to ensure the successful eradication of an infestation. Infestation by pests other than those listed above will be reported to the client together with recommendations and a quotation for eradication. Annual UV tube renewal and variety of electronic/glue board fly killer servicing packages with optional catchtray analysis to identify trends. Emergency service available 24 hours a day, 365 days a year. Optional digital photos within reports. Trend analysis carried out by our Field Biologists. On arrival report to the nominated pest control representative to discuss any reports on infestation. At the end of each treatment, complete and provide you with a copy of the Rokill Limited Treatment/Inspection Report, detailing any infestation found and any conditions which could adversely affect the control of pests on the premises. Discuss the findings with the nominated pest control representative. In addition, a minimum of one Field Biologist visit per annum to provide quality assurance and detailed type written report. Rodent and insect – single treatments or regular inspection and treatments at service intervals appropriate to individual premises. Proofing service – to deny access or harbourage to rodents and insects. Flying insect control – safe and efficient insecticidal treatments. Flying insect control – an extensive range of high quality electronic fly killing units. Flying insect control – supply and installation of fly screens, doors and windows. Urban bird control – proofing installations guaranteed to be effective. Specialist cleaning and disinfection of areas fouled by bird droppings and nesting materials.